Europaeisches Russland auch Schweden u. Norwegen, Dabei Uebersicht des Oesterreichischen u. Preussischen Staats. 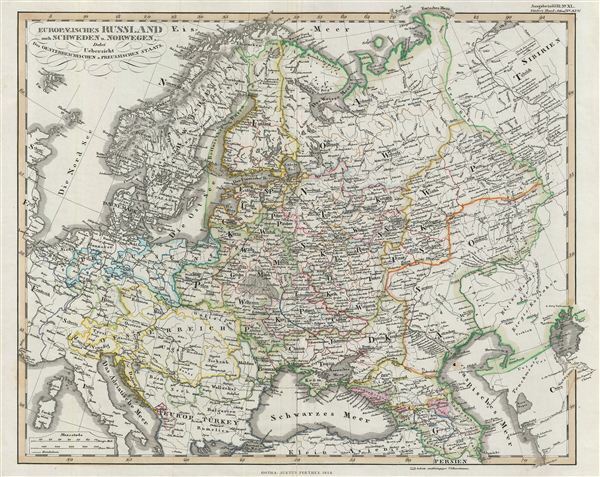 A fascinating example of the 1854 map of eastern europe. Centered on Russia, the map covers Germany, Norway, Sweden and Denmark and parts of european Turkey, Germany, Prussia, Italy and Austria. Russia at this time was under the suzerainty of Tzar Alexander the II. Alexander is best known for his liberal reforms including the emancipation Reform of 1861. The emancipation Reform freed Russia's countless serfs and is considered to be the most important event in 19th century Russian history. Throughout, the map identifies various cities, towns, rivers and assortment of additional topographical details. Political and regional borders are highlighted in outline color. Unlike other cartographic publishers of the period, the Justus Perthes firm, did not transition to lithographic printing techniques. Instead, all of their maps are copper plate engravings and hence offer a level of character and depth of detail that was impossible to find in lithography or wax-process engraving. All text is in German. Issued as plate no. 37a in the 1854 edition of Stieler's Hand-Atlas. Johan Georg Justus Perthes (September 11, 1749 - May 2, 1816) was one of the most important German cartographic engravers of the 19th century. He was born in the Thuringian town of Rudolstadt, the son of a court physician. In 1778, he began working as a bookseller in Gotha. Perthes began his publishing empire shortly thereafter with the 1784 issue of the famed survey of European nobility known as the Almanac de Gotha. In the next year, 1785, he founded the cartographic firm of Justus Perthes Geographische Anstalt Gotha. His son Wilhelm Perthes (1793 - 1853) joined the firm in 1814. Wilhelm had prior publishing experience at the firm of Justus Perthes' nephew, Friedrich Christoph Perthes, who ran a publishing house in Hamburg. After Justus Perthes died in 1816, Wilhelm took charge and laid the groundwork for the firm to become a cartographic publishing titan. From 1817 to 1890. the Perthes firm issued thousands of maps and more than 20 different atlases. Along with the visionary editors Hermann Berghaus (1797 - 1884), Adolph Stieler (1775 - 1836), and Karl Spruner (1803 - 1892), the Perthes firm pioneered the Hand Atlas. When Wilhelm retired, management of the firm passed to his son, Bernhardt Wilhelm Perthes (1821 – 1857). Bernhardt brought on the cartographic geniuses August Heinrich Peterman (1822 - 1878) and Bruno Hassenstein (1839 - 1902). The firm was subsequently passed to a fourth generation in the form of Berhanrd Perthes (1858 – 1919), Bernhard Wilhelm's son. The firm continued in the family until 1953 when, being in East Germany, it was nationalized and run as a state-owned enterprise as VEB Hermann Haack Geographisch-Kartographische Anstalt Gotha. The Justus family, led by Joachim Justus Perthes and his son Wolf-Jürgen Perthes, relocated to Darmstadt where they founded the Justus Perthes Geographische Verlagsanstalt Darmstadt. Very Good. Original centerfold. Blank on verso. Small verso repair along centerfold.